My daughter loves Dan from the Diamond Minecart. And I think she might love his wife, Jemma, even more (aka, xXJemmaMXx on her Youtube channel). 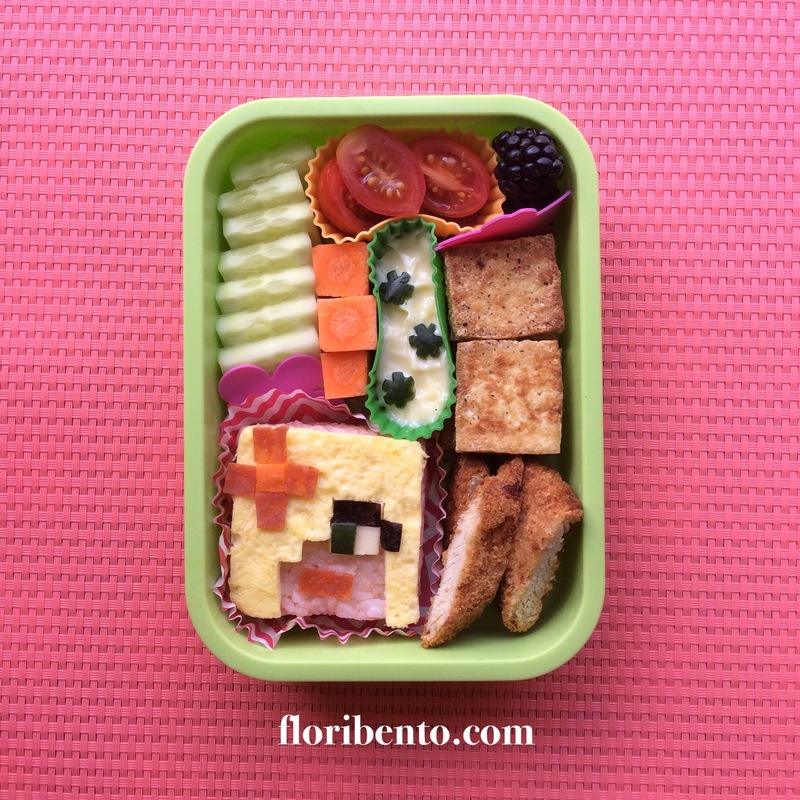 I made my Dan TDM bento for the kids as a surprise, and pretty much the moment she saw sandwich-Dan, she started lobbying for a Jemma lunch. I think I know who E. was pulling for during those Wife Vs. Husband SURVIVAL videos. Jemma is made from sushi rice colored with ketchup. The square shape came from pressing the rice into a square cookie cutter (lined with plastic wrap) and then popping it out. Her hair is a piece of egg sheet, and the details are done with salami, carrot, white American cheese, cucumber, and nori. Side dishes are (from bottom right): a sliced chicken tender, squares of pan-fried tofu, blackberries, grape tomatoes, cucumber squares, carrot blocks, and mayonnaise for dipping.